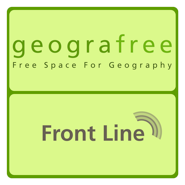 Welcome to geografree Front Line. Running since Summer 2008 Front Line always wants to push the boundaries. To get even more listeners/producers hooked on the Podcast, after 106 Episodes Front Line switches from German to English. Our aim is to see and hear geographical content in our day to day lives. Can we find geographical theories that explain what is going on in the world and in front of our doorsteps? Announcements inform about upcoming conferences and talks. We love to hear about your field trips, vacations and times as an exchange student. There is also a sound riddle to sensitize our auditory awareness and - of course - some great podsafe music.